Valentine’s Day is just a couple of days away, and for most people that means heading to the grocery store to pick up a some roses and chocolate for your sweetheart. Maybe you’ll even cave to Big Diamond’s marketing and buy some fancy jewelry with shiny rocks in it. But, if you really love your significant other, you’re going to have to work quickly to top Jiří Praus‏’ mechanical tulip that he made for his wife. At first glance, this looks like a simple and elegant wire sculpture mounted on a wood pedestal. But when you touch the stem, LEDs across the petals and the center of the flower light up in changing colors, and the entire flower opens up into bloom. It’s a really beautiful effect, and the mechanical motion adds a lot to the standard circuit sculpture aesthetic that has been so popular in the maker community lately. The petals are opened up by a small hobby servo that is hidden within the wooden base. That servo is controlled by an Arduino Nano, which is also tucked into the pedestal. In addition to the servo, the Arduino controls the LEDs. Those are seven Adafruit NeoPixel RGB LEDs, and 30 bright white SMD LEDs. Power comes from a simple DC power supply. What's behind the magic? Few pics of #mechflower internals. It is controlled by @arduino Nano. Moved by a servo. And light up by 7 @adafruit NeoPixels and 30 SMD bright white LEDs. We don’t know Praus’ wife, but we think she’ll enjoy this more than roses and chocolate this Valentine’s Day. 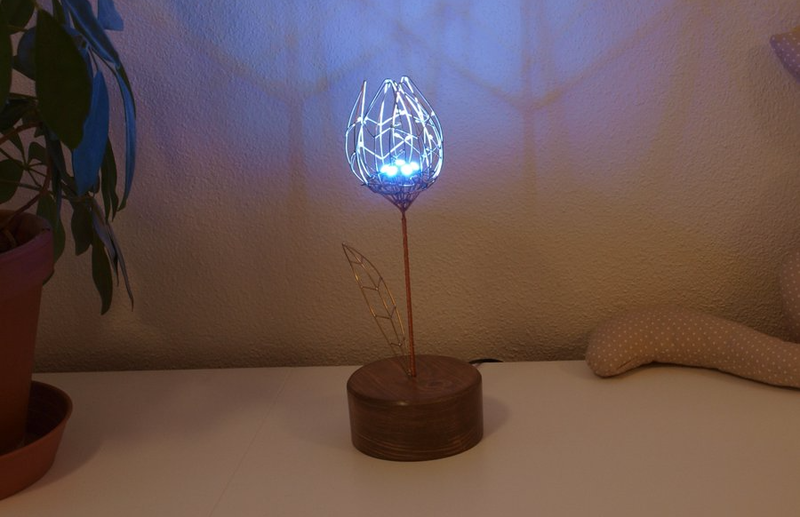 This Freeform Mechanical Tulip Is a Beautiful Valentine’s Day Gift was originally published in Hackster Blog on Medium, where people are continuing the conversation by highlighting and responding to this story.